Batangas' own Junior Munoz being interviewed at the Aboitiz Football Cup. Image source: Aboitiz Football Cup Facebook page. Mainly because Batangas isn’t exactly one of the established football hubs in the Philippines; and partly because few have really said so. 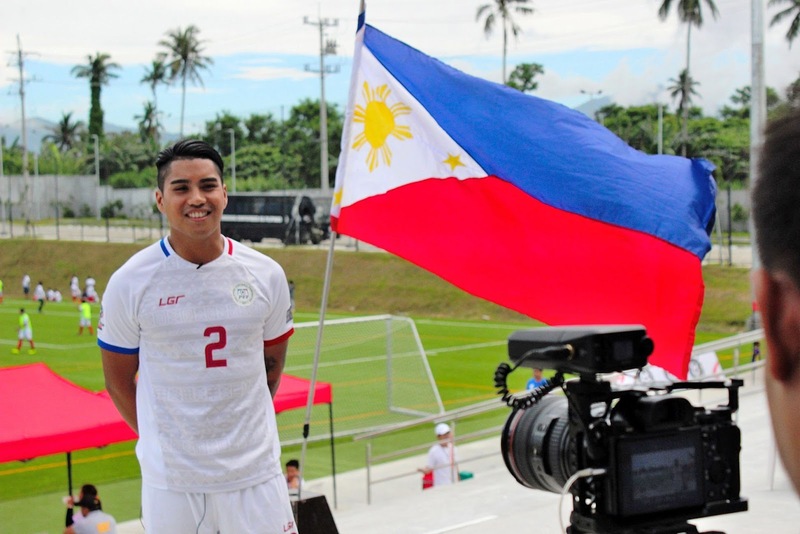 Netherlands-born Jim Junior Muñoz first burst onto the local football scene in 2012 when he signed for Makati-based club Kaya FC in the United Football League. He had a brief stint with the by-now Biñan-based club Stallions FC before returning to Kaya in 2015. At present, he suits up for Ceres Negros FC of Bacolod, champions of the first two seasons of the fledgling Philippine Football League1. Muñoz was introduced to Philippine Azkals fans in 2016 when he came on for Kevin Ingreso in a friendly international against Kyrgyzstan. At 31, he is at the prime of his football career and hopes to be part of the national team that will compete for the first time ever in the prestigious Asian Cup early next year. He begged off from participating in the Azkals’ training camp currently going on in Qatar as well as the 1-all draw with Oman in a full international friendly last Saturday, but hopes to be part of national team set-up again in the coming November FIFA international break. As to the Batangas connection, this used to be something vague. Commentators of televised Philippine Azkals matches as well as those of his club Ceres Negros would sometimes refer to his “Batangas roots” without really getting into the particulars. 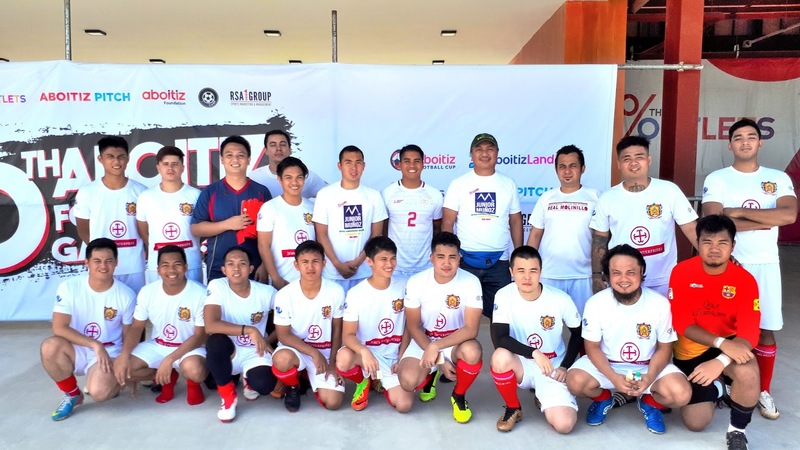 Yesterday, I had the honor of meeting Muñoz at the Men’s Open tournament of the Aboitiz Football Cup which was held at the Aboitiz Pitch at The Outlets at Lipa, a soon-to-open mall inside the LIMA Industrial Park at the border between Lipa City and the Municipality of Malvar. He was accompanied by his father and some relations, apparently a guest of the Aboitiz Cup; but he had also earlier sent word that he wanted to speak to me and Romualdo Yuson, President of my club ACF Real Molinillo de Lipa, about helping to develop football in Batangas. This was how I finally got to clarify Muñoz’s Batangas connection. His father, who introduced himself as “Jimmy,” said that he was originally from Santo Tomas, a northern Batangas locality recently elevated to the status of a city. He said that he used to work with an international air carrier based in Amsterdam and is now retired. His wife, he told me, is an Abgelina originally from the town of Padre Garcia right next to the Municipality of Rosario, sometimes referred to as the livestock capital of the Philippines. In other words, in Junior Muñoz, Batangas has its own full-blooded if foreign-born representative among the Philippine Azkals. Junior Muñoz poses with Lipa-based club ACF Real Molinillo de Lipa. Naturally, I had to ask Junior Muñoz if he spoke Tagalog. He said he could understand, as is typical of expatriate children, but not really speak the language except for a word here and there. In fact, he was able to follow the conversation in Tagalog I was having with his father, interrupting once in a while to clarify something with the latter in Dutch, but participating by and large in English. I laughingly warned him that when he tries to learn Tagalog, he has to learn the punto or the famed Batangas accent as well. At the moment, however, there is little motivation for him to try and learn Tagalog at all, based as he is in Bacolod where the language is Hiligaynon. He has not tried to learn Hiligaynon either, he says, because everyone talks to him in English, anyway; and he can conduct himself anywhere in that city perfectly well since everyone speaks the language in the first place.